Canon law is the name given to the rules that govern church order and discipline of the Roman Catholic Church. This valuable book, which has been updated to reflect changes and adaptations in canon law and new resources in the field, offers an introductory orientation of all of canon law. 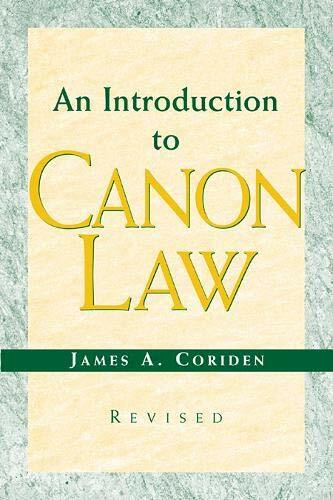 A superb teaching and learning tool, it provides outlines and overviews of relatively complex areas of canon law, sketches the basic structure and design of the various offices and functions within the church and how they relate to each other, and gives an orientation to the more important areas of canon law, as well as a background and context within which more detailed rules can be understood. Two appendices offer guidance for doing canonical research and case studies for further discussion. James A. Coriden, who holds an S.T.L. and J.C.D. from the Gregorian University in Rome, and a J.D. from the Catholic University of America, is professor of canon law and dean emeritus of the Washington Theological Union in Washington, DC. A priest ordained for the Diocese of Gary, he is one of the three general editors of the New Commentary on the Code of Canon Law and the author of An Introduction to Canon Law and The Parish in Catholic Tradition (Paulist Press).